I went out this weekend and bought a few more seed potatoes. I was looking for a late maincrop when I came across this variety I had never heard of before. Has anyone tried 'Peachbloom' potatoes? Thought I'd give it a go. I couldn't resist 'Red Duke of York' a stunning colour and a wonderful flavour too. We've had a couple of relatively warm days recently. My Rhubarb has started to get going. You can see on the compost around them I have been sprinkling wood ash. This time of year you can give your fruit bushes and trees a boost of potash by using the ash from any wood fires you have had. Wood ash only. I cleaned up my strawberry patch too, sprinkling some more wood ash around the plants and getting rid of old leaves. I dug up this crown and potted it up in the greenhouse. I look forward to an early crop of strawberries a few weeks before the others. Also in the greenhouse I used an old overwintered growbag to sow a few radish seeds. I should have a small crop of French Breakfast radish in a few weeks. This brings back memories for me, it was the first veggie that my Dad gave me to grow on his allotment when I was very small. I suspect many of you grew radishes at that age too? I decided to start off some of my tomatoes in a heated propagator too. Varieties here are Black Cherry, Sungella, Sungold, Cherokee Purple and a wonderful Golden Jubilee tomato. Broad beans Aquadulce Claudia are almost ready to be planted out. The weather will be warm this week, I might just do that. Still plenty of Cavalo Nero, or Tuscan Black Kale. A true stalwart this time of year. And speaking of Jubilee tomatoes. As I was sowing a few seeds I noticed that I have far more seeds than I could ever use, so I thought I would give them away. Seeing as we are celebrating a Diamond Jubilee this year in the UK, does anyone want a few seeds to plant? These are a late maturing, golden beefsteak tomato with fantastic flavour. Drop me an email with your address and I'll send you a few. I bought some Yorkshire forced rhubarb this week. Early stems of rhubarb are sweeter and contain more water than those picked later in the year. Well worth the extra cost for just a few bowls of lovely, sweet rhubarb. It annoys me therefore, that Sainsburys and Waitrose are selling forced rhubarb which comes from Holland! Grrrrr! The best rhubarb comes from Yorkshire! A sad sight awaited me when I went into my garden shed this week. My seed potatoes were unable to cope with the freezing temperatures we've had in the past few weeks. These Rocket early potatoes are soft and mushy. Fortunate that I hadn't bought any others yet, I will be replacing them in the next few days. Varieties will be Epicure, Rocket and Red Duke of York. I planted my first seeds in a heated propagator in the greenhouse this week. I have always wanted to try growing Pot Leeks. This year, I have been able to obtain some F1 Cairngorm pot leek seeds. Pot leeks have a much thicker shaft (Oooh Matron!) whereas blanch leeks have longer thinner shafts. Chilli seeds are best planted as early as possible. As long as you can protect them from extreme temperatures they appreciate a much longer growing season. These Black Pearl Chilli were given to me last year by a very kind fellow blogger, as part of my Black veggie collection. 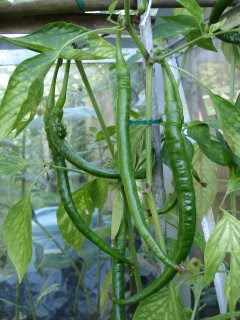 I haven't grown these Joe's Long chillis for a few years either. These are a hot Cayenne pepper, the plants can grow 4 or 5 feet tall, and the chillis can reach 10 or 12 inches long. Here are some that I grew a few years ago, they ripen to a stunning scarlet red. They made fantastic Christmas decorations strung together. At last the growing season has begun. Last Friday was a wonderful day. Matron was able to indulge all her passions in one day! I met a new friend in Celia from Purple Podded Peas. I travelled over to Cambridge to visit her garden. I met the assitant gardeners, and had a wonderful stroll around the vegetable patch. Then we set off on our journey, travelled through the market town of Saffron Walden, famous for its history of saffron trading. Saffron is an Autumn crocus which was grown nearby. Another of my passions is for walled kitchen gardens, and they come no better than the English Heritage garden at Audley End. Of course February is a quiet time, but the beautiful bones of the garden were still visible in these trained fruit trees. The county of Cambridgeshire is famous for growing fruit. You must have heard of the strawberry 'Cambridge Vigour' and the stone fruit 'Cambridge Gage' just to name two. Another of my passions is for choral music, and I was just thrilled to be able to attend choral evensong at Kings College Cambridge. The choir at the college is, in my mind, the best in the world. A Heavenly Choir of angelic voices, a perfect evening. But the evening wasn't quite over, we went to Tim Hayward's restaurant Fitzbillies for a stunning meal. Another passion shared, Tim also has a passion for food which is locally sourced and in season, you can't get better than that! Matron had a passonate conversation with the man himself , another passionate foodie. A conversation that ended with the subject of eating lambs testicles! If you can put deep fried pigs ears on the menu, then why not these? Don't knock them till you've tried them Tim! Just over four years ago I had the pleasure of meeting a fellow garden blogger face to face when I travelled to Seattle and met Paula from Petunia's Garden blog. We enjoyed it so much that she came back to London for a return match last year! 3 years ago I took the opportunity to meet up with Yolanda from Bliss Garden when she took a trip from her home in the Netherlands to the Savill Garden in England. So who's going to be next? Matron is looking forward to meeting up with another garden blogger this weekend. Boots polished and ready! I was in a bit of a dilemma at the end of the Summer as to whether to pick my crabapples or not. Well, my heart leapt this afternoon when my decision to leave them over Winter was vindicated. I couldn't quite make out who this garden visitor was, a bit thrush like, but with more grey and more brown.. so a few clicks on google image told me it was a Fieldfare. Usually lives in fields (does exactly what is says on the tin) but when the fields are covered in snow it travels to suburban gardens where it eats berries and fallen apples. Well that is exactly what it was doing in my garden. One in the crab apple tree, and another under the Bramley apple tree eating windfalls. Just click in the centre of each of these pictures and it will expand to give you a better view of this Winter beauty. Who needs crabapple jelly anyway! There's life in the old dog yet! Leo enjoying a game of snowballs in the garden this morning. What a set of gnashers!